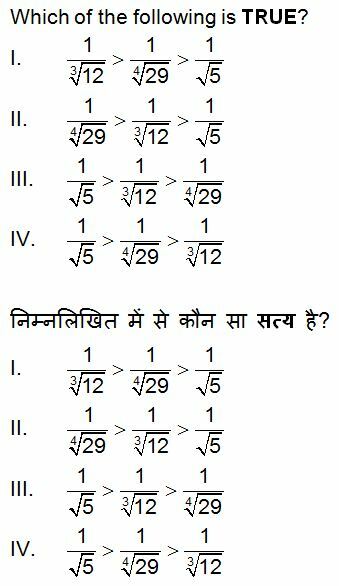 SSC CGL (Tier - 2) Online Exam Paper - 2017 "held on 17 February 2018"
QID : 1 - What is the unit digit of the sum of first 111 whole numbers? QID : 2 - How many 100 digit positive number are there? QID : 5 - What is the unit digit of (217)413 × (819)547 × (414)624 × (342)812? QID : 8 - N is the largest two digit number, which when divided by 3, 4 and 6 leaves the remainder 1, 2 and 4 respectively. What is the remainder when N is divided by 5? 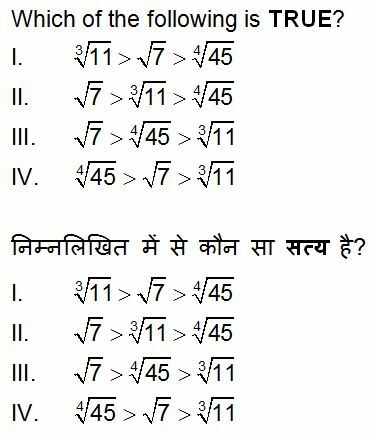 QID : 10 - A and B are positive integers. If A + B + AB = 65, then what is the difference between A and B (A, B ≤ 15)? QID : 11 - What is the value of 143 + 163 + 183 + … + 303? QID : 13 - If x + y + z = 0, then what is the value of (3y2 + x2 + z2)/(2y2 – xz)? QID : 14 - If P = 7 + 4√3 and PQ = 1, then what is the value of 1/P2 + 1/Q2? 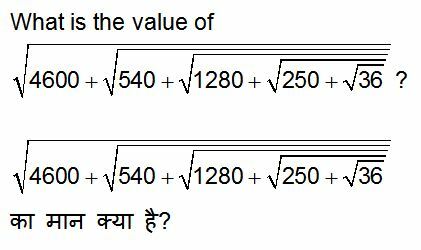 QID : 15 - If a3 + 3a2 + 9a = 1, then what is the value of a3 + (3/a)? QID : 16 - x, y and z are real numbers. If x3 + y3 + z3 = 13,x + y + z = 1 and xyz = 1, then what is the value of xy + yz + zx? QID : 17 - If (a + b)/c = 6/5 and (b + c)/a = 9/2, then what is the value of (a + c)/b? QID : 18 - If x3 + y3 + z3 = 3(1 + xyz), P = y + z – x, Q = z + x – y and R = x + y – z, then what is the value of P3 + Q3 + R3– 3PQR? QID : 19 - If x1x2x3 = 4(4 + x1 + x2 + x3), then what is the value of [1/(2 + x1)] + [1/(2 + x2)] + [1/(2 + x3)]? QID : 20 - If α and β are the roots of equation x2 – x + 1 = 0, then which equation will have roots α3 and β3? QID : 21 - If 3x + 5y + 7z = 49 and 9x + 8y + 21z = 126, then what is the value of y? QID : 22 - Cost of 4 pens, 6 note books and 9 files is Rs 305. Cost of 3 pens, 4 notebooks and 2 files is Rs 145. What is the cost (in Rs) of 5 pens, 8 notebooks and 16 files? 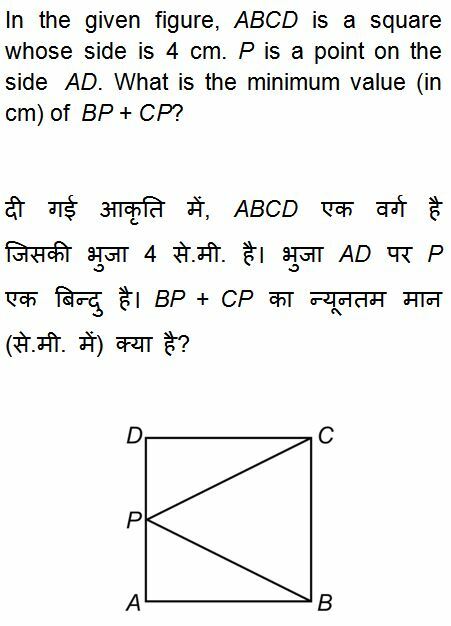 QID : 23 - ABC is a right angled triangle. ∠BAC = 90o and ∠ACB = 60o. What is the ratio of the circum radius of the triangle to the side AB? 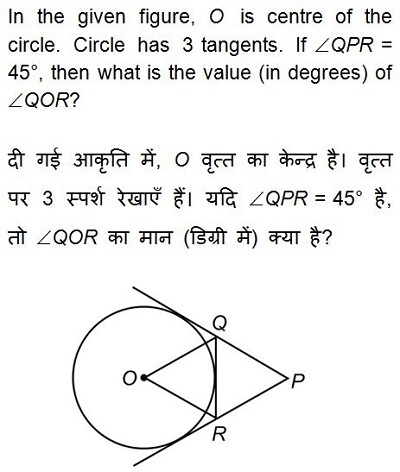 QID : 25 - Triangle ABC is similar to triangle PQR and AB : PQ = 2 : 3. AD is the median to the side BC in triangle ABC and PS is the median to the side QR in triangle PQR. What is the value of (BD/QS)2? 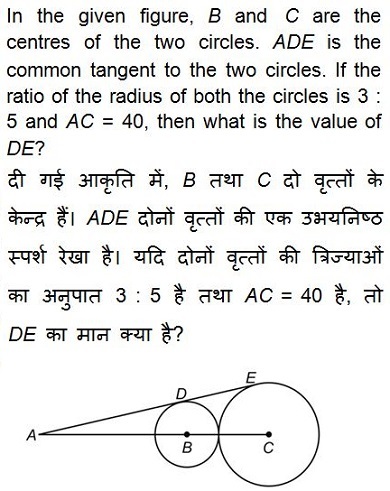 QID : 28 - AB and AC are the two tangents to a circle whose radius is 6 cm. If ∠BAC = 60o, then what is the value (in cm) of √(AB2 + AC2)? QID : 32 - The radius of two circles is 3 cm and 4 cm. The distance between the centres of the circles is 10 cm. What is the ratio of the length of direct common tangent to the length of the transverse common tangent? 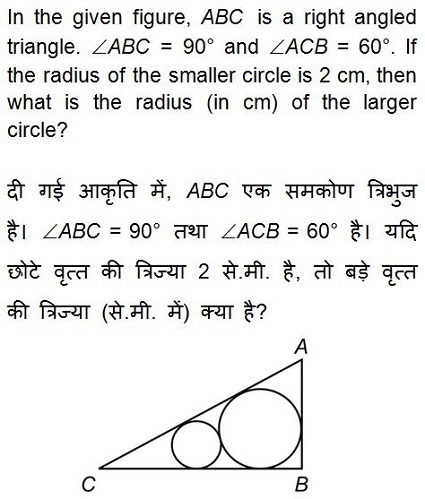 QID : 33 - ABC is a triangle. AB = 5 cm, AC = √41 cm and BC = 8 cm. AD is perpendicular to BC. 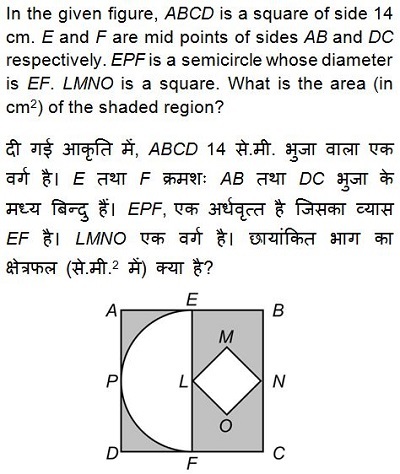 What is the area (in cm2) of triangle ABD? QID : 37 - Length and breadth of a rectangle are 8 cm and 6 cm respectively. The rectangle is cut on its four vertices such that the resulting figure is a regular octagon. What is the side (in cm) of the octagon? QID : 40 - A right prism has a square base with side of base 4 cm and the height of prism is 9 cm. The prism is cut in three parts of equal heights by two planes parallel to its base. What is the ratio of the volume of the top, middle and the bottom part respectively? QID : 41 - Radius of base of a hollow cone is 8 cm and its height is 15 cm. A sphere of largest radius is put inside the cone. What is the ratio of radius of base of cone to the radius of sphere? QID : 42 - The ratio of curved surface area of a right circular cylinder to the total area of its two bases is 2 : 1. If the total surface area of cylinder is 23100 cm2, then what is the volume (in cm3) of cylinder? QID : 44 - 10 identical solid spherical balls of radius 3 cm are melted to form a single sphere. In this process 20% of solid is wasted. What is the radius (in cm) of the bigger sphere? QID : 45 - The radius of base of a solid cylinder is 7 cm and its height is 21 cm. It is melted and converted into small bullets. Each bullet is of same size. Each bullet consisted of two parts viz. a cylinder and a hemisphere on one of its base. The total height of bullet is 3.5 cm and radius of base is 2.1 cm. Approximately how many complete bullets can be obtained? QID : 46 - A cuboid of size 50 cm × 40 cm × 30 cm is cut into 8 identical parts by 3 cuts. What is the total surface area (in cm2) of all the 8 parts? QID : 48 - What is the value of [(sin x + sin y) (sin x – sin y)]/[(cosx + cosy) (cosy – cosx)]? QID : 49 - What is the value of [(tan 5θ + tan 3θ)/4 cos 4θ (tan 5θ – tan 3θ)]? QID : 50 - What is the value of (4/3) cot2 (p/6) + 3 cos2 (150o) – 4 cosec2 45o + 8 sin (p/2)? QID : 51 - What is the value of sin (B – C) cos (A – D) + sin (A – B) cos (C – D) + sin (C – A) cos (B – D)? 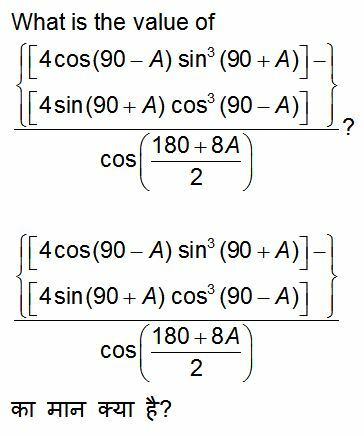 QID : 53 - What is the value of cos [(180 – θ)/2] cos [(180 – 9θ)/2] + sin [(180 – 3θ)/2] sin [(180 – 13θ)/2]? QID : 54 - What is the value of [tan2 (90 – θ) – sin2 (90 – θ)] cosec2 (90 – θ) cot2 (90 – θ)? QID : 55 - Two points P and Q are at the distance of x and y (where y > x) respectively from the base of a building and on a straight line. If the angles of elevation of the top of the building from points P and Q are complementary, then what is the height of the building? QID : 56 - The tops of two poles of height 60 metres and 35 metres are connected by a rope. If the rope makes an angle with the horizontal whose tangent is 5/9 metres, then what is the distance (in metres) between the two poles? QID : 57 - A Navy captain going away from a lighthouse at the speed of 4[(√3) – 1] m/s. He observes that it takes him 1 minute to change the angle of elevation of the top of the lighthouse from 60o to 45o. What is the height (in metres) of the lighthouse? If A equals to 15% of total applicants who are present at exam centre F and B equals to present applicants at exam centre K, then A is what percent of B? Total number of offline applicants from exam centre H, K and F are how much less than the total number of present applicants from exam centre G and J? What are the total number of offline applicants from the exam centre F, H, J and G? What is the ratio of total number of present applicants from exam centre K to total number of offline applicants from exam centre J? What are the total number of present applicants from exam centre H and G together? QID : 63 - Solution A contains 10% acid and solution B contains 30% acid. In what ratio should solution A be mixed with Solution B to obtain a mixture with 25% acid? QID : 64 - In what ratio should coffee powder costing Rs 2500/kg be mixed with coffee powder costing Rs 1500/kg so that the cost of the mixture is Rs 2250/kg? QID : 65 - A and B started a partnership business investing in the ratio of 3 : 8. C joined them after 4 months with an amount equal to 3/4th of B. What was their profit (in Rs) at the end of the year if C got Rs 24,000 as his share? QID : 66 - A and B invest in a business in the ratio 4 : 5. After 10 months B leaves the business after withdrawing his investment. In the first year the business made a profit of Rs 49,000. What is B's share (in Rs) of this profit? QID : 67 - Working together A and B can do a job in 40 days, B and C in 36 days and all three together in 24 days. In how many days can B alone do the job? QID : 68 - A, B and C can do a job working alone in 50, 75 and 20 days respectively. They all work together for 4 days, then C quits. How many days will A and B take to finish the rest of the job? QID : 69 - A can do 50% of the job in 16 days, B can do 1/4th of the job in 24 days. In how many days can they do 3/4th of the job working together? QID : 70 - A and B can together complete a task in 18 hours. After 6 hours A leaves. B takes 36 hours to finish rest of the task. How many hours would A have taken to do the task if he worked alone? QID : 71 - 1 packet of biscuits costs Rs 16 but a pack of 4 of the same packet of biscuits costs Rs 56. What is the effective discount (in %) on the pack? QID : 72 - The cost price of an article is Rs x. It is marked up by 200%. It is sold at Rs 540 after giving 25% discount. What is the value of x (in Rs)? QID : 73 - A Rs 750 tin of cheese is offered at 8% discount and a Rs 1,250 tin of butter at 20% discount. If we buy 5 tins of cheese and 3 tins of butter, what is the effective discount we get (in %)? QID : 74 - The selling price of an article is Rs 816 if the discount on it is 15%. What would be the selling price of the article (in Rs) if the discount on it is 25%? QID : 75 - The entry ticket at a fun park was increased in the ratio 7 : 9, due to which footfalls fell in the ratio 13 : 11. What is the new daily collection (in Rs), if the daily collection before the price hike was Rs 2,27,500? QID : 76 - If 6A = 4B = 9C; What is A : B : C? QID : 77 - If 50 less had applied and 25 less selected, the ratio of selected to unselected would have been 9 : 4. So how many candidates had applied if the ratio of selected to unselected was 2 : 1. QID : 78 - What is the fourth proportional to 189, 273 and 153? QID : 79 - Rs 11,550 has to be divided between X, Y & Z such that X gets 4/5 of what Y gets and Y gets 2/3 of what Z gets. How much more does Z get over X (in Rs)? QID : 80 - Before a battle the ratio of tanks to planes in an army was 5 : 3. During the war 1000 tanks were destroyed and 800 planes were destroyed. The ratio of tanks to planes became 2 : 1. What is the number of tanks after the war. QID : 81 - The average marks of 50 students in an examination was 65. It was later found that the marks of one student had been wrongly entered as 83 instead of 38. The correct average is? QID : 82 - In a class of 50 students there are 22 girls who scored an average of 35 marks in the test. What is the average marks of the boys if the class average is 42 marks? QID : 83 - The average of 41 consecutive odd numbers is 49. What is the largest number. QID : 84 - A batsman scores 87 runs in the 21st match of his career. His average runs per match increases by 2. What was his average before the 21st match. QID : 85 - Oil equal to 20% of the weight of ground nut is extracted in a mill. The matter left after extraction is sold as cattle feed at the rate of Rs 12.5/kg. The groundnuts are bought at Rs 20/kg. The processing cost is Rs 5/kg. At what price (Rs per kg) should the oil be sold to earn 20% profit on total costs (Total cost = Cost of groundnuts and Processing costs)? QID : 86 - If a vendor sells a coconut at Rs 14.4 he makes 10% loss. If he wants to make 25% profit, then at what price (in Rs) should he sell? QID : 87 - At a village trade fair a man buys a horse and a camel together for Rs 51,250. He sold the horse at a profit of 25 % and the camel at a loss of 20 %. If he sold both the animals at the same price, then the cost price of the cheaper animal was Rs ____________. QID : 88 - On a certain item profit is 150%. If the cost price increases by 25% what will be the new profit margin (in %)? 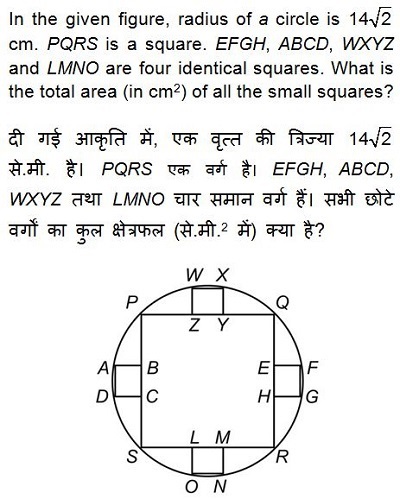 QID : 89 - 40% are the passing marks. A student gets 250 marks yet fails by 38 marks. 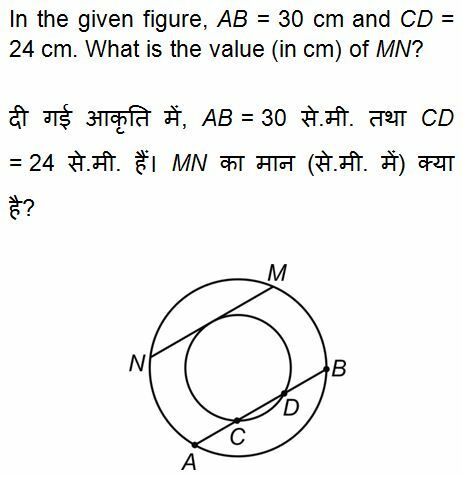 What is the maximum marks? QID : 90 - Ravi is 12 years younger than Surya. Ravi's age is 40% of the sum of his and Surya's age. What will be Surya's age 9 years hence? QID : 91 - 5% of a = b, then b% of 20 is the same as __________. QID : 92 - A man's annual income has increased by Rs 5 lakhs but the tax on income that he has to pay has reduced from 12% to 10%. He now pays Rs 10,000 more income tax. What is his increased income (in Rs lakhs)? QID : 93 - A racing car going at an average speed of 108 km/hr takes 15 minutes to complete a lap on a racing track. By how much should it increase its speed (in km/hr) to complete the lap in 12 minutes? QID : 94 - Train A takes 45 minutes more than train B to travel a distance of 450 km. Due to engine trouble speed of train B falls by a quarter, so it takes 30 minutes more than Train A to complete the same journey. What is the speed of Train A (in km/hr)? QID : 95 - Two cars A and B travel from one city to another, at speeds of 72 km/hr and 90 km/hr respectively. If car B takes 1 hour lesser than car A for the journey, then what is the distance (in km) between the two cities? QID : 96 - B starts 4 minutes after A from the same point, for a place at a distance of 7 miles from the starting point. A on reaching the destination turns back and walks a mile where he meets B. If A's speed is a mile in 8 minutes then B's speed is a mile in ____ minutes. QID : 97 - If the amount on a certain principal in 3 years at 12% rate of interest compounded annually is Rs 12,000, what will be the amount (in Rs) after the 4th year? QID : 98 - The amount (in Rs) received at 10% per annum compound interest after 3 yrs is Rs 1,19,790. What was the principal? QID : 99 - In how many months will Rs 8,000 yield Rs 2,648 as compound interest at 20% per annum compounded semi-annually? QID : 100 - What is the rate of interest (in %) if simple interest earned on a certain sum for the 3rd year is Rs 2,000 and compound interest earned in 2 years is Rs 4,160?